All my life, I’ve been drawn to women older and wiser. 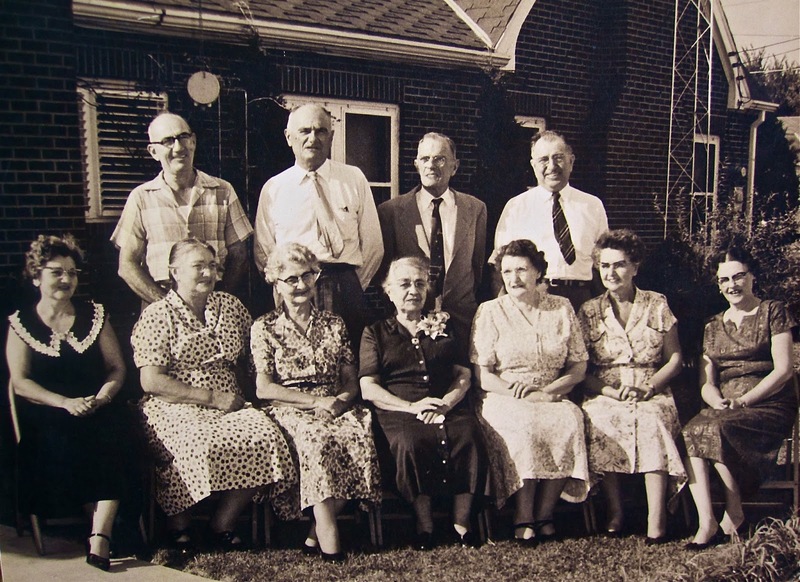 I like to imagine my grandmothers, although long gone, as young girls, and I stare hard into the faces of friends, some now in their 80s, sure that I see youth, even child-like innocence, in their eyes, even as I value their advice and experience. Nevertheless, I weighed her advice carefully, respecting the opinion that came from her 101 years. George Rodrigue also embraces this wisdom. 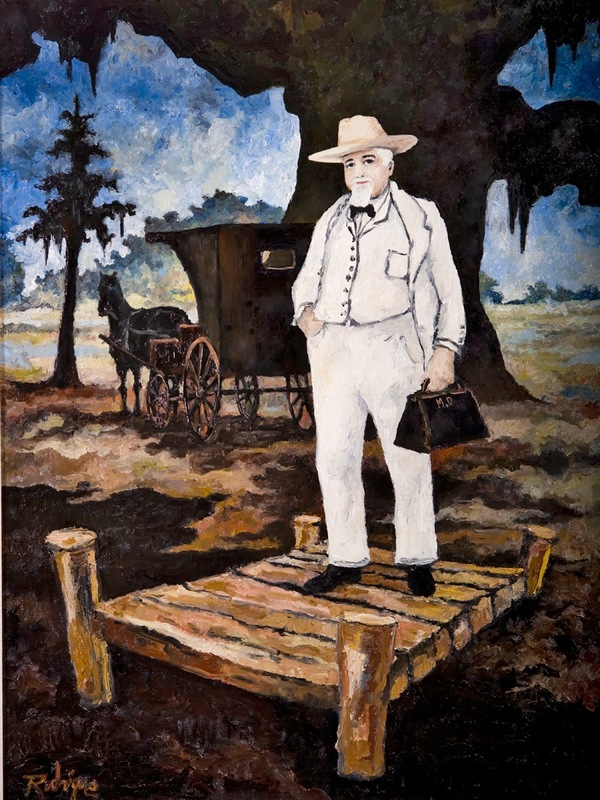 He preserves these scenes within paintings, illustrating his mother’s 1924 school class and other early snapshots, such as Boudreaux in a Barrel, elucidated in his own way from the tiny black and white photographs in Marie Courrege Rodrigue’s album. 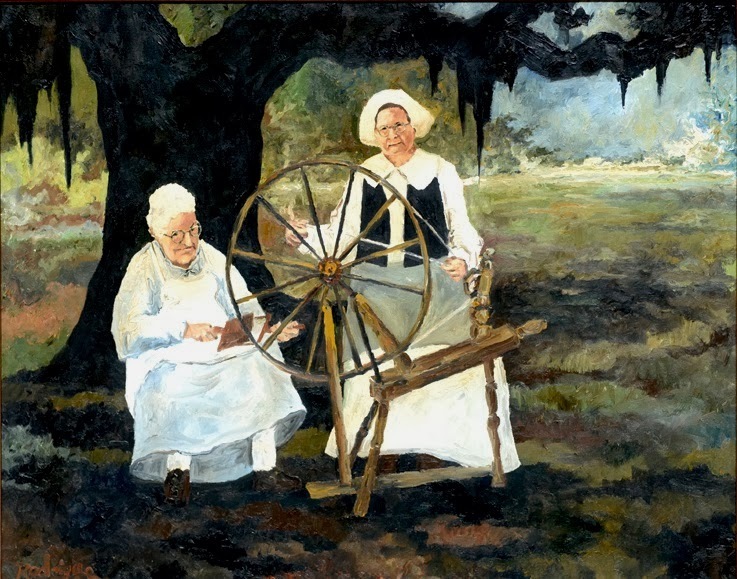 He also appreciates these scenes from other Cajun families, recreating them on his canvas within family portraits and paintings of nineteenth and early twentieth century Acadian life. 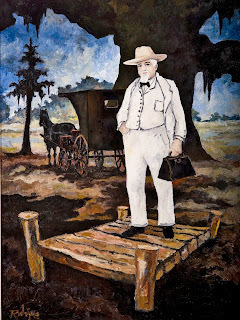 George Rodrigue grew up an only child; however, he was part of an elderly and large extended family, with older parents who were each the youngest of their combined twenty-six siblings. 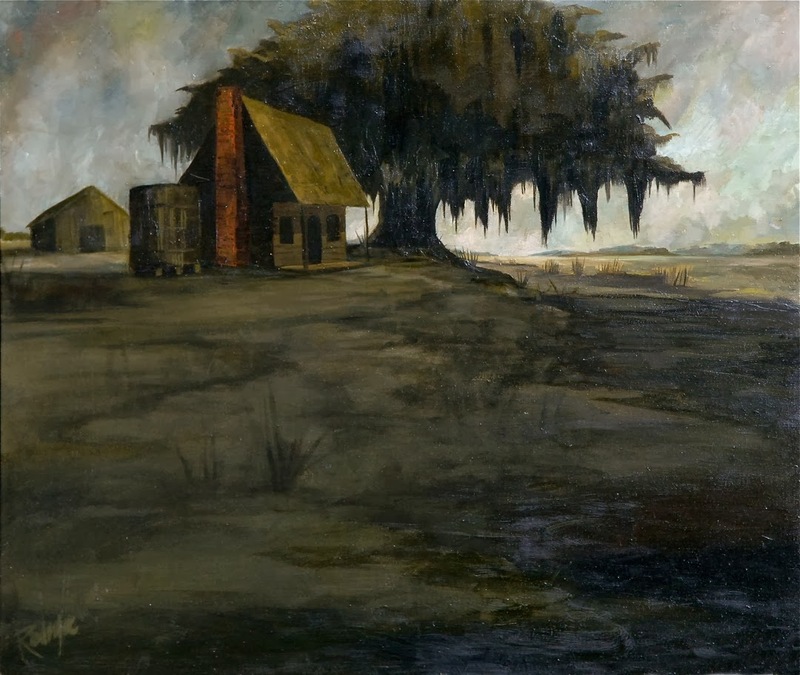 It was the fading Acadiana, as remembered by his parents, aunts and uncles, that Rodrigue preserved, beginning in the late 1960s, on his canvas. This includes not only genre scenes from photographs, but also imaginary scenes, particularly of Louisiana landscapes, as idealized by a Cajun artist’s eye. 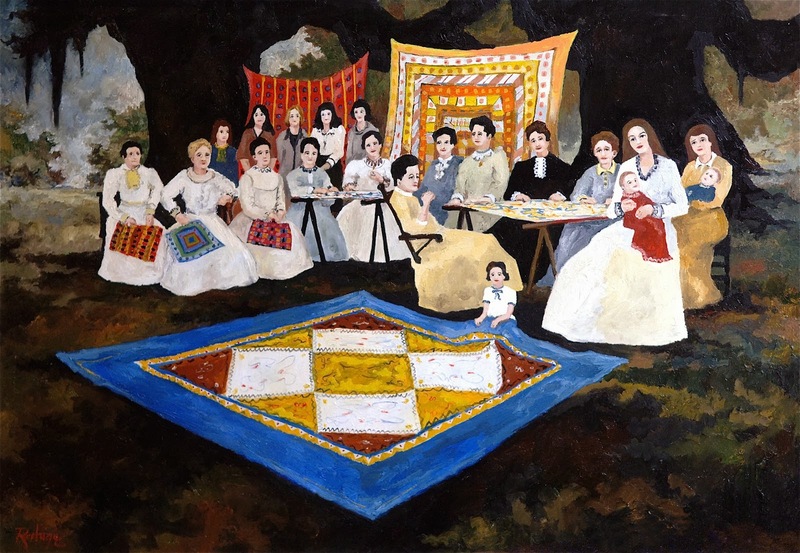 In a sense, Rodrigue inserts his own ancestral wisdom and unique vision onto his canvas just as a spinner might within a quilt. “While her mother, Anaise, would ‘card’ the cotton, Therese would spin the yarn on the spinning wheel, as had been done by the Acadians for two centuries. 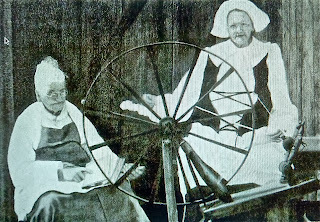 “She produced an extensive and handsome collection, including bedspreads ‘courte pointe,’ rugs, blankets, quilts and handbags. Her pride and personal preference, however, was the ‘courte pointe’ (bedspread) expemplified by the ‘cross and diamond’ in a cordonne, boutonne work-syle. “Goose quill toothpicks, Wendy, that’s what I need!” declared a wise friend recently, her eyes sparkling like a young girl's. I’ll do my best, I promised, even as I knew that, like the early spinners, we’d have better luck finding such a doctor on George’s canvas than we would on google. Very insightful, Wendy. Wisdom does come with age, for some anyway!! 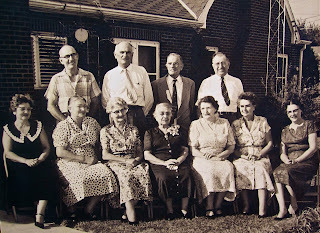 Granny and Grandma were certainly our best dispensers of random acts of wisdom.